Students’ learning experiences – what they learn, and how, when, and where they learn it – are tailored to their individual needs, skills, and interests, and enable them to take ownership of their learning. Although where, when, and how they learn might vary according to their needs, students also develop deep connections to each other, their teachers and other adults. In addition, we asked our consulting experts to reflect on four specific approaches to personalized learning described by the Bill and Melinda Gates Foundation: learner profiles; personal learning paths; competency-based progressions; and flexible learning environments (see glossary, page 33). 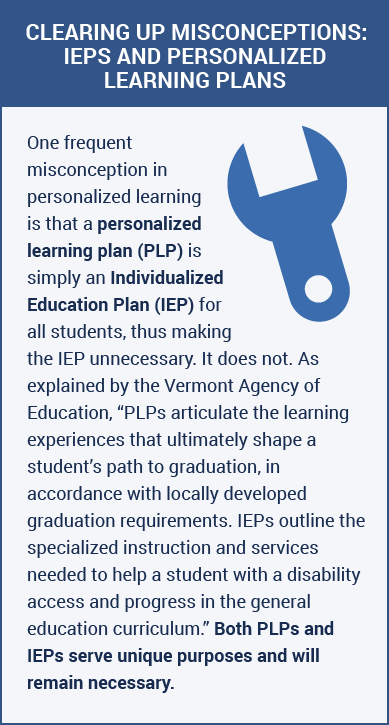 When we refer to personalized learning generally, any of these approaches can be utilized to fit the type of personalized learning a school or district is implementing. Where any of these approaches have unique implications, we specifically address that approach and use the corresponding terminology.